Second set in a series of outstanding arrangements by Raymond Burley, featuring some gems from the quintessential Spanish repertoire. Mallorca, a barcarolle, was originally in F sharp minor, but I have relocated it in the more 'guitar-friendly' key of D minor. Córdoba, however, remains in its original key. Apart from raising a handful of bass notes by an octave, these arrangements for three guitars present the composer's notes virtually intact. 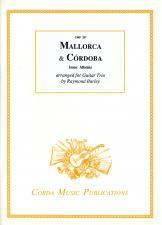 Mallorca is his Op.202, and Córdoba is the fourtth piece from Op.232 Chants d'Espagne. Albéniz's phrase marks appear in the parts but have been omitted from the score to avoid cluttering the page.